After 7+ years of loyal service I had to put down a long time friend this morning. He was an amazing and loyal friend that I spent many hours with each and every day. He was such a trooper, always there for me when I needed him. No matter if it was early in the morning, or late at night or even during 10-12 hour work days. We shared many memories together over the years and I am incredibly sad to see him go. The last several months he was in a lot of pain though. He didn’t once complain but I knew he was suffering and his time was nearing the end. He had lost usage in a couple of his legs and his arms were… well… let’s just say they’ve seen better days. He was no doubt suffering and I just couldn’t stand to see him suffer any longer. This morning filled with emotion I said my goodbyes and carried him outside to prepare him for his final resting place among the stars. It is funny the things we remember when we have to part with something that just did its job day in and day out. My friend and I wrote many lines of code together over the years. We’ve answered hundreds of thousands of emails, read hundreds of thousands of web sites, watched thousands of Youtube videos and connected with friends online via Facebook and Twitter together. We were together during the creation of many presentations I’ve given to the community. He was there when we bought our first house. He was there with me when I first read about the passing of a loved one, or the birth of a new family member. He was there to help me catalog the memories of my life digitally, whether it was creating a movie or uploading photos. He was there to help pay the bills throughout the years. He was there to make sure my time at work was comfortable. He was there when we learned of tragic events like earthquakes, tornados, and even tsunamis. He was there everyday listening to the music I liked, and never once said change the channel I don’t like this one. 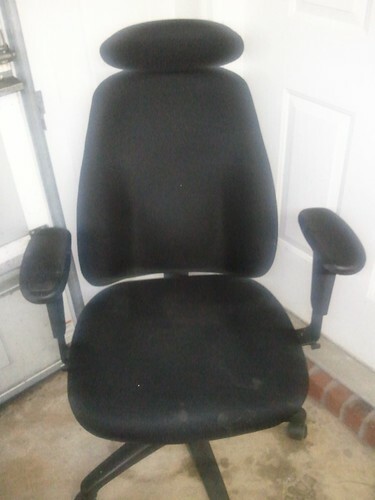 Dear friend, my office chair, it is sad to see you go. We made lots of memories together. Rest in peace. Last night I was driving home and saw something run out in front of the truck. Turns out it was a very young Chihuahua puppy. He ran up under the truck and I spent the next few minutes trying to coach him out with no luck. Finally some neighbors that live down the street stopped to help. But then again we couldn’t get him out. Ellen (wife) drove by and we decided we could get him out with some food. Long story short after about 20-30 minutes we finally got him out from under the car. Without any further adieu I give you TACO! The poor guy was just scared to death. I can’t blame him, he’s only a few inches tall. I brought him home and gave him food and water and watched over him as he didn’t want to leave my side. Last night he spent the night in my bathroom. This morning Taco and I took the trash out and I showed him the best spots in the yard to use the bathroom. I’m not sure what we’ll do with him if we can’t find his owner (I honestly think someone dropped him off), but whatever it is it Taco will have a better life. It didn’t take Taco long this morning to start running the kingdom. He has officially taken over. He managed to overthrow the other two dogs without a fight and take their bed. The other dogs retreated under my desk to take watch to see what Taco’s next move was going to be. Taco is a dog of compassion. He thought about it for awhile and came to the conclusion it wasn’t fair for the other dogs who were here first. Thus he allowed them to come back and rest. But only if they gave him the best spot. I’ve been receiving a lot of phone calls, text messages and emails this evening about what’s going on with the hurricane where I live and how it is going to impact us. Here is where things stand and our preparations. I’ve been using the following map to assist in tracking hurricane Gustav. Some of you have asked where I’m at so here is a map of where Gustav is supposed to track along with an arrow pointing where we are located. As you can tell we are about 60 miles inland. Right now it is roughly 8:00 PM on Sunday August 31st and we are already seeing outer band rains and winds. The local stations are doing a great job keep us up to date on what to expect. We are supposed to have power outages in the area but they will not be as wide spread as when Katrina hit. Winds are estimated to reach up to 70+ miles / hour so definite damage will happen. Anything can happen at any time depending which way the hurricane tracks. But as long as it stays to the west, I think we’ll be ok.
We’ve prepared pretty heavily for the storm. Thursday I hit the stores getting supplies. Mainly non-perishable items (canned foods, etc). Saturday I got up and started working in the yard. I went to the gas station down road to get gas for the lawnmower and it was crazy. People had already started evacuating and there was a line. While I was there I filled up the two cans I brought with me and then went back to the house. I filled up the lawn mower and generator then took all five gas cans back to get them filled up. I got the generator running pretty easily. Surprisingly it started on the first lick. I stabilized the gas and changed the oil. In total we have 25 gallons of gas on hand and we have both vehicles full of gas. Getting gas early is key because once the evacuations start, gas goes quickly as thousands upon thousands of people hit the highways. Then of course, if the power goes out, gas can’t be pumped. In case we have to go days without power we’ve got non-perishable foods, two coolers of ice, three cases of bottled water, 2 cases of Gatorade, a window air conditioner (that I’ll take back to Lowe’s if we don’t wind up using it), an extra chain saw blade to cut limbs and trees, batteries, a bathtub full of water, Sirius Satellite Radio to keep informed, extension cords, meat to cook with on the grill that is currently in the freezer, five bags of charcoal, lantern, 5 propane bottles, a shower bag, and a propane stove. Basically, if you want to prepare for a hurricane, just think about going camping and pack all of that. This evening it was sunny and pretty so I broke out the video camera and filmed the place including the entire outside of the house, shed, yard, surrounding trees, and back of deck. I mainly did that for insurance purposes and to remind us what things looked like before and after. I was thinking about putting up a before and after video. That of course depends on how bad the after is. To keep everyone informed I will more than likely be twittering events as things progress (follow me here http://twitter.com/keithelder). Things aren’t supposed to heat up until early in the morning. If you have me on instant messenger and see that I’m no longer online, then I’ve lost power and or cable Internet. If things are like they were when Katrina hit, the power will go before cell phones. Thus I should be able to get messages out. Like everyone we are just hoping for the best. We’ve prepared as well as we can and now it is just a waiting game. I can’t remember the last time I went camping, especially with my family. I’ve been on some one night excursions but I haven’t been on an all out full blown camping with my family since I was little. We used to camp all the time back in the summer. My Dad’s brother’s, Jerry and Lavaughn, along with our cousin Bobby are at the point in life where they are really having fun. Together they’ve combined forces and have amassed a rather large collection of man toys. Tractors, bull dozers, backhoes, a fleet of 18 wheelers, campers, boats, a custom theater and game room to just name a few. One of their latest acquisitions was a grill. And I’m not talking about a little charcoal grill. I’m talking about a grill that requires a truck to pull it around that can cook an entire cow in one cooking! I was informed they’ll be bringing the “man” grill camping this weekend. They’ve already got the meat and wood to smoke it all up. Can you say fantastic!? For those that don’t know where JP Coleman State Park is it hangs off the Tennessee River where Tennessee, Mississippi and Alabama converge. It is a massive body of fresh water. A lot of people don’t actually know this but you can put a boat in anywhere along the Tennessee river and drive it all the way to the Gulf of Mexico or even all the way to Pennsylvania or even Minneapolis, MN! How? The Tennesee-TomBigbee Waterway makes that possible. The waterway connects 14 river systems totaling 4500 miles of navigable waterways that serve mid-America. My Grandfather used to have a home right on the waterway where we would fish and ski. Needless to say, all of this is a massive body of freshwater. And that means GREAT fishing and skiing. If you haven’t ever explored our country’s river system it would be worth your time to investigate it. Here’s a map to give you a closer perspective of where we’ll be camping. I also think this is the first time I’ve shown where I grew up on my blog. A couple of years ago, my sister moved to North Carolina and she didn’t have a place to store their popup camper. She gave it to me when they moved. I used it a couple of times but the camper had problems. Eventually those problems turned into major problems. I tried to set the camper up this past weekend but couldn’t. The wood around all the sides was completely rotted. I had a friend come over who is a carpenter to see if he could fix it. After looking at it more I decided it wasn’t worth my time nor money to fix it and just gave the camper to him. With the camping trip only a week away, I needed to purchase a tent. I started looking at tents and decided that I would purchase a tent that would cover the back of my SUV. I like the concept of having access to the back of the SUV to store things and also being able to watch a DVD from the tent with the trucks DVD player (I know, rough life). After a lot of searching around I decided on the Napier Sportz 81000. Our tent will be arriving tomorrow and I have a few other things I need to purchase like a cooking stove. I’m sure I’ll be taking lots of pictures during the trip and hopefully have some prize catfish to show off when we return. It is going to be nice to just get away from the home office and enjoy nature for a few days over the Memorial Weekend.